It is startling to realize that our ancestors in France and Germany were accustomed to the cave lion. Lions and tigers are so much associated with hot climates today, that it is easy to forget that cave lions lived side-by-side with mammoths, woolly rhinos, cave bears and the like until the end of the Pleistocene. Cave lions competed for large prey, such as deer, wild cattle and horses, with early Homo sapiens in Europe. The cave lion figured in Palaeolithic art, including cave wall paintings from France and ivory sculptures from Germany. But where does the cave lion fit taxonomically: is it a separate species, Panthera spelaea, or is it a subspecies of the extant lion, Panthera leo spelaea? Molecular studies by Burger et al. (2004) show that it is a mere subspecies, very close kin of the living African lion. The researchers were able to extract DNA from the subfossil bones of two cave lions, dated as 32,000 and 47,000 years old. Both came from cave deposits, in Austria and Germany respectively. The bones were tested for evidence of diagenesis (chemical change after burial) and their condition was good. DNA was then extracted in two laboratories and the usual scrupulous care was taken to ensure no contamination: one laboratory was used only for ancient DNA work and had never been used for analysis of modern DNA; each laboratory is washed down with bleach and irradiated overnight with UV rays. Such care is essential to ensure that no contamination from humans or any other modern organism could affect the results. The cytochrome b gene sequence from the cave lions was compared with a range of modern great cats, and the extinct animals turned out to have nearly identical sequences (as expected) and to pair closely with a clade of extant lions, including the four extant subspecies of Panthera leo, the African and Asiatic lions (see illustration). The five subspecies of P leoare then related to P. pardus, the leopard, and then P. tigris, the tiger. 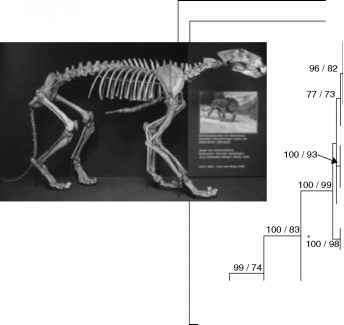 The split of the subspecies of P. leo appears to have happened some time after 600,000 years ago, when a single species split into European and African divisions, and then the Asiatic lions branched off some 75,000-200,000 years ago. known from extensive remains in the caves it used as a refuge from the icy plains over which it hunted. The seals, sealions and walrus (Pinnipedia) form a part of the arctoid group. Zoologists used to split the pinnipeds into two independent groups, but a great deal of morphological and molecular evidence (Wyss and Flynn, 1993; Flynn and Nedbal, 1998) suggests that the carnivores entered aquatic niches once only. 1989). The teeth are somewhat simplified, and Enaliarctos has flippers with shortened limb bones and elongated digits, although the bones are not so flattened as in later pinnipeds. It was the size of a modern harbour seal, about 1.5m long. 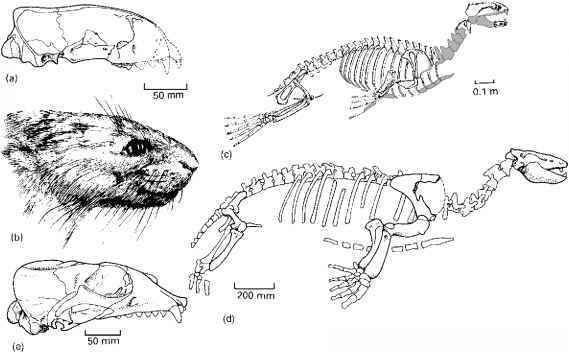 Allodesmus (Figure 10.39(d)), a des-matophocid, also from the lower Miocene of California is seal-like in many respects (Mitchell, 1975). It is 2m long, has broad paddle-like flippers, a very reduced tail, large eyes and possibly some ability to detect the direction of sound underwater. phocids lived mainly in the Atlantic and Mediterranean area. With climatic deterioration during the Pliocene and Pleistocene, all three families extended their ranges, and the seals acquired their modern worldwide distribution. The pangolins, Pholidota, are ant-eaters and not very obvious relatives of the Carnivora. Indeed, systematists have wrestled with pangolins for two centuries: they have been placed as relatives of pantolestans and creodonts, but were generally paired with Xenarthra, partly because of their toothlessness and general resemblance to ant-eaters and armadillos (Novacek et al., 1988). Rose and Emry (1993) questioned this assumption, and molecular evidence (Murphy et al., 2001; Springer et al., 2003) now places them firmly in the Laurasiatheria and the Ferungulata, and probably as sister group to Carnivora. Pangolins have a skull that is reduced to a tubular structure with a narrow lower jaw and no teeth. The tongue is immensely long, longer than the head, and can be shot out and looped round corners to extract ants from obscure locations. Pangolins are heavily armoured with broad overlapping 'scales'and they resemble nothing so much as animated globe artichokes. The seven extant species of pangolins live in Africa and south-east Asia. Fossil pangolins are known from North America and the oldest is Eomanis from the Eocene Messel pit in Germany (Storch, 1978; see pp. 337-9), a surprisingly modern-looking form (Figure 10.40). If this is a pangolin, and Rose and Emry (1993) cast some doubt, it indicates an origin of the group far from its modern territories.